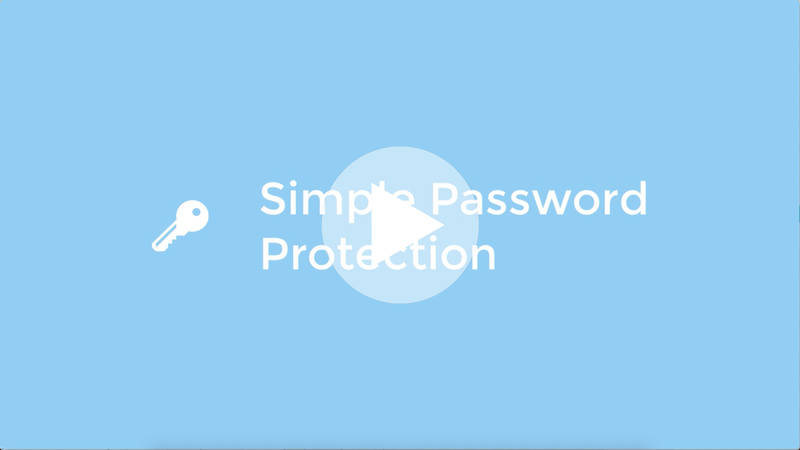 We offer a solution for when you need to simply and quickly lock your single media or an entire playlist with a single password. Allowing only viewers with the password access to your media. If you want to check out some Password Restriction Demos and extra information please visit our Password Protection information page. To set a single Simple Password you will need to select the media you wish to password protect from the central Media Management Panel. With the chosen media selected, click on the Access Control tab in the Lower Settings Panel. Under Password Protection click on the Drop Down menu and select Simple Password. You will be presented with a Password field where you can enter the password you would like to use to access the media. After entering your desired password simply click on the ✅ Save button to save your changes. You can restricts an entire Playlist to your preferred single Simple Password. This will make all videos and media files within the playlist to require the password you have set. To set a all videos and media files within a Playlist to be Simple Password protected, simply click onto the Playlist button in your Media Section. Select the Playlist you would like to change to be Simple Password Protected. With the Playlist selected click on the Access Control tab in the settings bar. Under Password Protection, select your Simple Password from the drop down menu. This will open a popup information box asking you if you want to change the current default package to your newly chosen Password. In the popup you get the opportunity to revise any affected media by clicking on the Summary buttons. Select the media you wish to apply the new Simple Password to by selecting the ☑️ Check Mark next to it. You can change your Simple Password for a media player or playlist player. Simply select the media you wish to change from the central Media Management Panel. Under Password field, simply overwrite the current password to your new one. Click on the ✅ Save button to save your changes. The previously active password will now no longer be able to access the media player. If you no longer wish to use the Simple Password you can select the media you wish to set back to Free to watch from the central Media Management Panel. Under Password Protection click on the Drop Down menu and select Access Without Password. Now simply click on the ✅ Save button to save your changes. Your media player will now no longer require a password to be viewed. The methods above use a single password to access restricted media. If you wish to have multiple passwords for a single media player or playlist please follow our tutorial on creating Custom Password Packages and Adding Password Groups to Password Packages.